Pam breaks the tension by laughing nervously. Doug apologises to Jim saying it's in his nature to flirt, and he's sorry - if it was happening to Pam he wouldn't be too happy either. He tells Beverly she should be flattered that Jim cares so much about her which manages to deflate Beverly's anger somewhat. 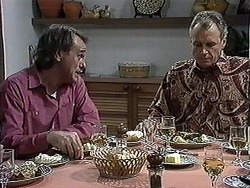 Doug apologises again to Jim and says he's a bit of a stirrer, but he doesn't mean any harm. He wants Jim to tell him when he's annoyed with him in the future so they can sort it out. JIM: I think it's best we drop the whole thing. I just don't know what came over me. He apologises and says he's got a green- eyed monster he can't control sometimes. They awkwardly resume eating dinner. Beverly goes to get some mineral water. 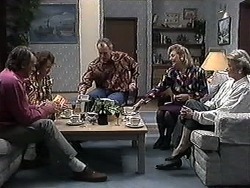 Pam smooths things over by telling them another time that Doug's flirting got them into trouble at the vicar's house! Just then, Jim starts choking on a chicken bone! Helen calls for Beverly, but there's no time. 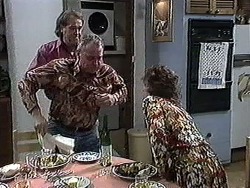 Doug quickly gets Jim on the floor and performs the Heimlich Manoeuvre, getting his airway open again. Jim staggers to his feet, and Beverly, who has just returned to the room, congratulates Doug. Doug thanks him too. 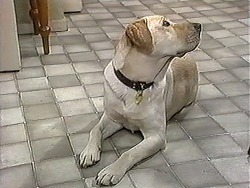 DOUG: Jim, like I told you, if you've got a bone to pick with me, you've got to let me know! No good trying to swallow it, eh? Todd and Cody are revising maths. But instead they start looking at old photos which are lying around since the Willises are packing up their house. She also shows Todd photos of Adam, Brad and Gaby. But she can't find any photos of her as a baby, although there are plenty of her three siblings. CODY: I don't get it. Not one baby photo. TODD: Maybe you were so ugly as a kid that every time your folks tried to take a photo of you, the camera broke. Cody pushes him, and starts looking through another album. 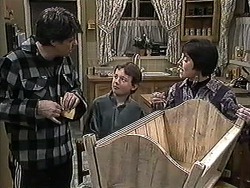 CODY: Once I find it, you'll see just how cute I was, Todd Landers! Joe and Toby are sanding down the crib that Joe found at the dump. It's looking a lot better now that it is down the bare wood. Kerry tells Joe that Toby has some things in the school craft fair tomorrow. Toby asks Joe to come along - he's got a surprise piece in the exhibition. Joe agrees to juggle his day around so he can come. When Toby has gone to bed, Kerry asks Joe what he's going to do with the rest of the stuff he got at the tip. He says he's waiting for inspiration! Pam is explaining that her daughter Gaby is in Japan and Brad is on a sports scholarship to the USA. Adam is house- sharing. Beverly brings in the photos of the camping trip that have just come back. Doug looks at the photos, which are quite good. Pam says it looks like the spot where Doug and Brad went - Doug slipped and got a leg full of spinters - he looked like a porcupine! 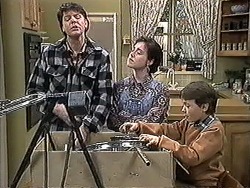 Jim tells them it reminds him of the way he and Beverly met - over a metal splinter in his bum(!) They are all getting on very well. 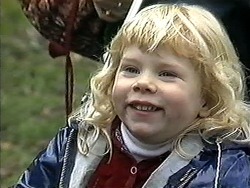 Cody is still looking for photos of her when she was younger than two - there don't seem to be any at all. "Dear Mr and Mrs Willis. We are pleased to inform you that your application to become adoptive parents has now been accepted. You are now officially on our waiting list." Todd and Cody consider the implications. CODY: No wonder there are no photos of me younger than two. I'm not even a Willis. Todd, I'm adopted! Jim is telling Doug and Pam about Hilary matchmaking him and Beverly. Pam tells the story of meeting Doug in a cab. Pam used to help her dad out driving his cab. PAM: It was a great way of meeting all sorts of weird and wonderful people. Even had a bloke get into my cab one night stark naked! HELEN: Oh, you're pulling our legs! PAM: Honest, ask Doug. It was him! He explains he did it on a dare - although he was carrying a bunch of flowers to protect his modesty. BEVERLY: What did you say when he got into your cab? PAM: What could I say? I asked him where he got his lovely bunch of flowers! DOUG: So I gave them to her, at the end of the trip. 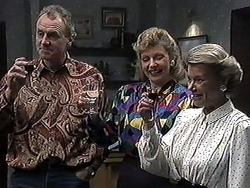 HELEN: I think Ramsay Street's been waiting for people like you, so I propose a toast. To Pam and Doug. 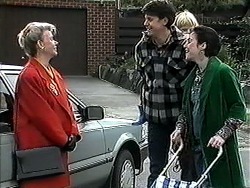 Welcome to Erinsborough. DOUG: Here's to all of us. New friends and neighbours. Joe, Kerry, Toby and Sky are on their way to Toby's craft exhibition. They pass a sculpture in a park and Joe says it doesn't look like art to him. He starts chuckling but Kerry explains that modern art is all about expressing a feeling or an emotion. Cody is looking through boxes when Pam comes in. CODY: Mum, why don't I look like you or Dad? PAM: Oh, I don't know. Sometimes it just works out that way. Cody presses Pam on who she looks like in the family, but Pam can't think of anyone. Cody asks what time of day she was born, but Pam can't remember. Cody asks to look at her birth certificate, but Pam says it could be in any of the boxes - Cody will have to wait until they're unpacked at the new place. Helen is going out to meet Diane Beaumont to finalise the details of the Wilcox Art Scholarship. Beverly gives Helen a letter and says she will miss Des when he moves out. She has offered Des the use of the surgery flat in the meantime. She asks Jim if they can offer Matt a room while he's looking for a flat and Jim agrees. 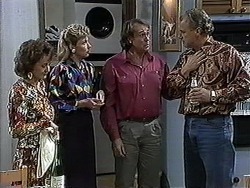 When Helen has gone, Beverly says at least they'll be gaining the Willises when they lose Des, and reckons that Jim and Doug will be great mates, despite the shaky start. JOE: Think I'm in the wrong business! Kerry comes to see Beverly. She tells her that she can't stomach milk lately, but Beverly says it's nothing to worry about - she should just get calcium from other sources, and take a supplement. Just then, Kerry's baby flutters. Beverly has had a flutter herself, but not for a few days. Todd sneaks up on Cody. Cody tells him she's been talking about Angie Jones as she is adopted too. Todd sighs and says Cody doesn't know for sure yet. Cody is unmoved and says the evidence is irrefutable! Since this morning, Cody has found a box with everyone's birth certificates in it, except for hers! CODY: I just want to know why my parents haven't told me! Todd tells her that it's not going to change anything either way - she'll still feel the same way about her parents, even if she is adopted. Joe has got a load of junk together to make a modern art sculpture. Kerry laughs, but Joe says if people are willing to pay thousands for it, who is he to argue?! KERRY: What's the theme for this creation? KERRY: I mean, you know, what statement are you making on the human condition? JOE: Oh, fair go, Kez, I couldn't tell you at this point. The thing is though, it's coming from here where it's important. He puts a hand on his heart. KERRY: Well, I hope you've worked out all your positive and negative space ratios. JOE: Oh, yeah. Yeah, sure. As far as I can see, it's all in the wrist action. He piles some stuff up, but it falls off on to the floor. They all wince. Helen gets back from her meeting. Beverly is just putting her stethoscope away and tells Helen that she was just checking up on the baby. Helen thinks Beverly should make an appointment with her obstetrician, just in case. Beverly says there's nothing to worry about, but when Helen isn't looking, she suddenly starts looking very worried and goes straight to ring her obstetrician. 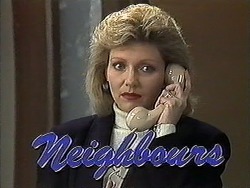 BEVERLY: Hello, Dr Carter's surgery? I'd like to make an urgent appointment please.